1965. The Israeli Mossad send a three person team, two men and a woman to Soviet controlled East Berlin. Their mission is to capture a notorious Nazi doctor who had performed human experimentation in an extermination camp during World War II. We flip forward to the present day when all three have long been hailed as heroes but are going to relive their heroism as the daughter of the woman has just published a book recounting their story. However the trio has been keeping a secret for over thirty years and it would seem that secret is about to be discovered. This 2011 film, in English with subtitled German and Ukrainian, is a remake of a 2007 Israeli film done in Hebrew and German. This is a thriller with suspense, intrigue and a surprise twist. Clocking in at 77% on Rotten Tomatoes, this is a score worthy of a trip to the show. If there is a stumbling block, it is the switch between 1965 and the present day. This mission in East Berlin is carried out by a trio who are in their mid to late twenties and we have one set of actors who are young. The present day being thirty or more years later is represented by a different set of actors who are older. While the woman is always the woman, there is some confusion as to which young man matches with which older man. That lack of clarity made the story somewhat difficult to follow as the film moved back and forth between the mission and now. In the older group, we have some very familiar faces with Helen Mirren, Tom Wilkinson and Ciarán Hinds. Mr. Hinds, an Irish actor, also starred as a Mossad agent in the 2005 film Munich by Steven Spielberg. The younger trio, Sam Worthington, Jessica Chastain and Marton Csokas are all recognisable as mainstream actors in their own right. I will add another name, Jesper Christensen as the Nazi doctor. This Danish actor seems to have had a busy career in Danish only recently transitioning to English. Of note, he played the mysterious villain Mr. White in the James Bond film Casino Royale and its sequel, Quantum of Solace. As an aside, I have to comment on the recreation of East Berlin in 1965. I found that well done. Okay, I'm not an historian and others may take exception with this, that and the other thing but for me, it seemed like a good portrayal of a Soviet occupied country with that grimy, grey slum look about it. One curious thing brought up in the film was that when Berlin was divided into East and West, the line apparently did not follow the train tracks. In various places trains from the West had to pass through territory which officially belonged to the East. The movie states that Soviet guards were at each of the stations on the east side and trains were never supposed to stop. I've been trying to find information about this but so far haven't found anything. It seems like another one of those oddities from the U.S.S.R. trying to block the Western nations after WWII. Like me, anyone will wonder if this story is true or not. It's fiction. Obviously the Israeli authors of the 2007 screenplay based the doctor on the real-life Joseph Mengele but the story itself is made up. This is a good film which kept me interested. As I said, it's only failing is the switch between the young agents in 1965 and their present day counterparts; that's a bit confusing. Other than that, it's a good story with an intriguing plot twist. This merits a night out at the movies. Its time-shifting narrative creates distracting casting problems, but ultimately, The Debt is a smart, well-acted entry in a genre that could use more like it. 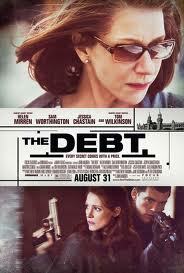 The Debt is a 2011 drama-thriller film directed by John Madden based on a screenplay written by Matthew Vaughn, Jane Goldman and Peter Straughan. The film is a remake of the 2007 Israeli film of the same name by Assaf Bernstein. It stars Helen Mirren, Sam Worthington, Jessica Chastain, Ciarán Hinds and Tom Wilkinson. HaHov, HaChov, or in English, The Debt, is a 2007 Israeli drama-thriller film directed by Assaf Bernstein and starring Gila Almagor, Yuriy Chepurnov, and Oleg Drach, about three retired Mossad agents confronted by a challenge from their past.